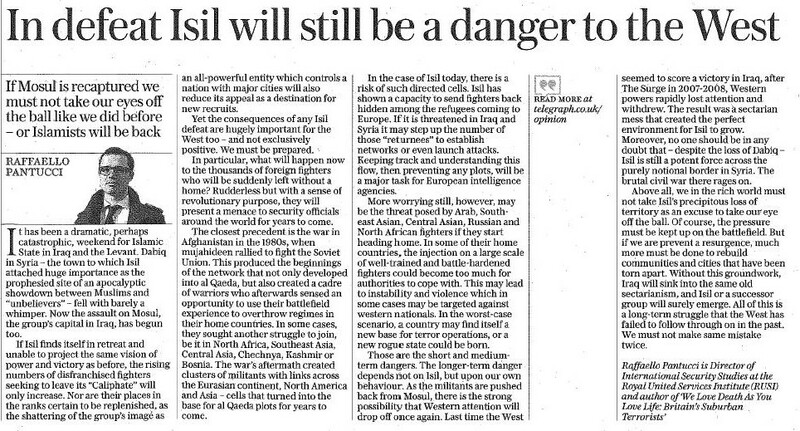 Another piece for the Telegraph, this time after the fall of Mosul, looking in particular at the worrying consequences subsequently if attention is not paid to the fall out. It has been a dramatic weekend for Isil. The symbolically significant town of Dabiq in Syria fell over the weekend, and then, this morning, the assault on Mosul, their capital in Iraq, has begun. This likely heralds the beginning of a period of retrenchment for the group, as they find themselves in retreat and unable to project the same vision of power and victory and before. The consequences for the West are important. Undoubtedly the threat from the group will evolve, and work needs to be done now to ensure that the mistakes of the past are not repeated. We must lay the groundwork to properly eradicate the group, rather than let Iraq sink into sectarianism as it did in the past. A major concern is what will happen now to the mass of foreign fighters who will be suddenly left without a home. Rudderless but with a sense of revolutionary purpose, this group will present a menace to security officials around the world for years to come. In terms of the numbers of fighters who have gone to fight in Syria and Iraq, it is hard to find an exact precedent. The closest is the war in Afghanistan in the 1980s when the mujahedeen rallied to fight the Soviet Union. This produced the beginnings of the network that later developed into al Qaeda, but also created a cadre of warriors who sensed an opportunity to use the battlefield experience they had honed in Afghanistan on overthrowing regimes in their home countries. In some cases, the revolutionary fighters kept on going, seeking another struggle to join, be it in Algeria, Chechnya, Kashmir or Bosnia. The war’s aftermath created clusters of militants with links to each other across the Eurasian continent, North America and Asia – cells that later turned into the base for al Qaeda plots for years to come. How this will replicate now is difficult to predict. The speed and nature of the flow of fighters that went to Syria and Iraq to fight with Isil is different. But there’s a high probability of a threat and it will be a combination of things. There is an obvious risk of directed cells. Isil has shown a capacity to send individual fighters back hidden among the flow of refugees coming to Europe. This will likely continue, with a confusing mix of individuals returning home feeling that their fighting days are over, alongside individuals tasked with establishing networks or even launching attacks. Keeping track and understanding this flow, then preventing any plots emerging now or in the future will be a major concern to European authorities for some time. Communities of Arab, South-east Asian, Central Asian, Russian and North African fighters may also decide to start heading home. In some of their home countries, the injection on a large scale of well-trained and battle-hardened fighters may become too much for authorities to cope with. This may lead to instability and violence which in some cases may be targeted against western nationals. The fall of Mosul is likely to exacerbate this flow. As various reports appear to indicate, the numbers of disenfranchised fighters who are seeking to leave the Caliphate is increasing. The loss of Mosul will shatter the vision of the group as an all-powerful entity which controls a nation with major cities, something that will inevitably reduce its appeal as a destination for people to go to. In many ways, however, it is exactly now that the longer-term danger rears its head. As the group is pushed back from Mosul, not only will its threat evolve, but there is also the possibility that western attention will drop off once again. Last time the West seemed to score a victory in Iraq, western powers rapidly lost attention and withdrew. The result was a sectarian mess in Iraq that provided the groundwork for Isil, creating the environment from which it was able to grow. In addition, while the group is losing ground in Syria – as evidenced most recently by the loss of Dabiq – it is still a force on the ground and the brutal civil war there rages on. The danger is now that with thi precipitous loss of territory, the rich world’s attention will wane. And in taking our eye off the ball, the stage may be set for Isil to re-group and re-establish itself. The pressure must be kept up on the battlefield, but also in terms of finding ways of rebuilding communities and cities that have been torn apart by conflict. All of this is a long-term struggle that the West has failed to follow through on in the past. It is essential to make sure that this same mistake is not made twice.